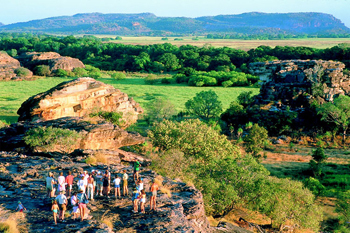 About this tour: Australia Expedition: Wild, spiritual and remote – welcome to East Arnhem Land. 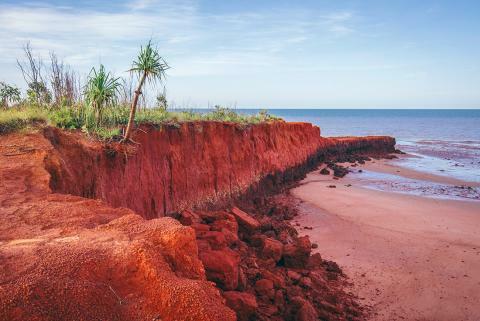 • Start Gove, Australia and reutrning to Gove, Australia - airfares from Darwin to Gove return not included - see airnorth. 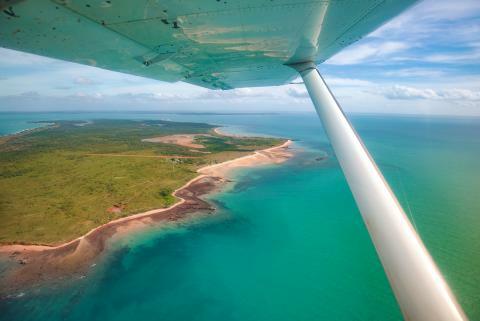 • Catch an early flight from Darwin to Gove and head directly to Nyinyikay homelands by air. Arrive at Nyinyikay and be greeted with a traditional Welcome to Country and a welcoming dance. 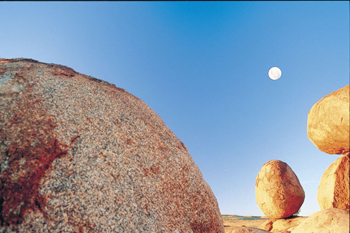 This important tradition ties into one of the areas Dingo song lines, which you will learn about during your time here. After being officially welcomed, unpack your bags and settle into your tents. The tents are quad share and hold single beds with inner spring mattresses. After lunch, spend the remainder of the day learning about Yolngu culture. 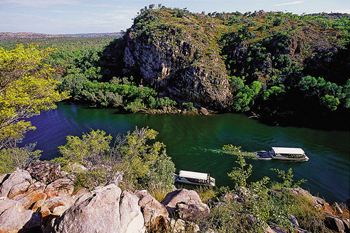 • Enjoy two days of cultural activities with the Nyinyikay traditional owners. 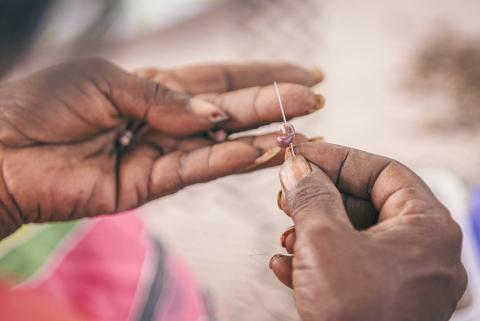 These activities could include making spears and Yidaki (Didgeridoos) for men, or collecting materials and dyes for basket making. 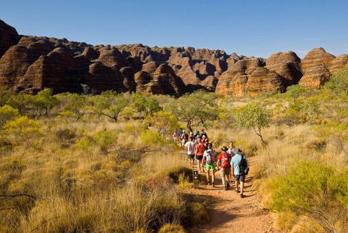 There will also be an opportunity to witness the hunting and gathering methods that have fed the Yolngu for generations and to try some of the food that has been caught or collected. If you’re more interested in the traditional arts, the homeland also teaches some traditional dances as well as bark painting. At the end of each day, sit with the traditional owners around the fire and make the most of this unique opportunity to learn about their culture. • Say farewell to your Nyinyikay hosts and get ready for the flight to Bremer Island. From Bremer Island air strip it’s a short drive to the Banu Banu Wilderness Retreat, where you can enjoy the rest of the afternoon at your leisure. 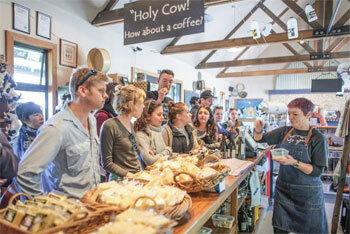 You’ll be spending the next two nights here and there are plenty of activities to try during your stay. 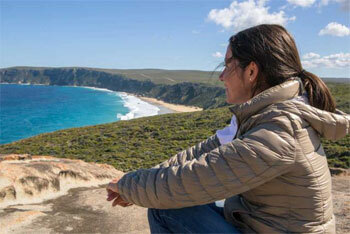 Perhaps set out on one of the many walking trails through the dunes, practice some bird watching or beach combing. The hand built sunset viewing platform is ideal to watch the sun disappear behind the ocean. You may even have the privilege of watching baby turtles hatch in August and September. 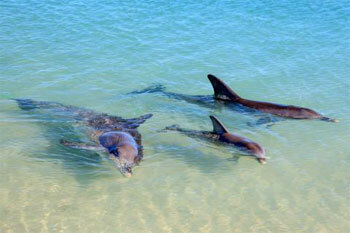 They choose Bremer Island as their chosen place to nest and lay their eggs only metres away from the Driftwood shack. 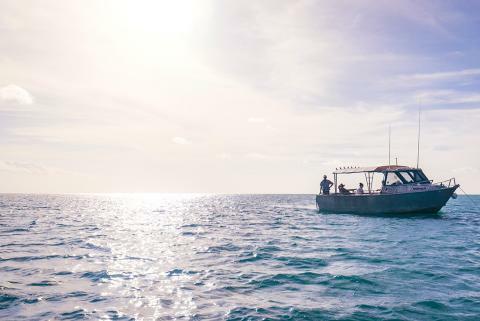 If you're perhaps feeling like a bit more adventure, head out on the boat for a days fishing or exploring East Bremer Island, a pure white sand Island a short boat ride away from BanuBanu. • Enjoy one final breakfast at this calm waterside retreat before catching a boat back to mainland Australia. 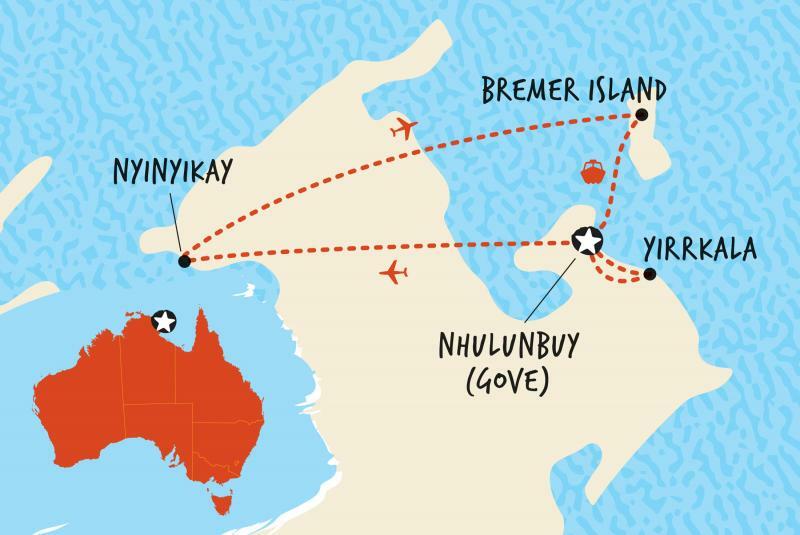 Join your trip leader for a tour of the Nhulunbuy and Yirrkala townships, including a visit to Yirrkala’s world famous art gallery. 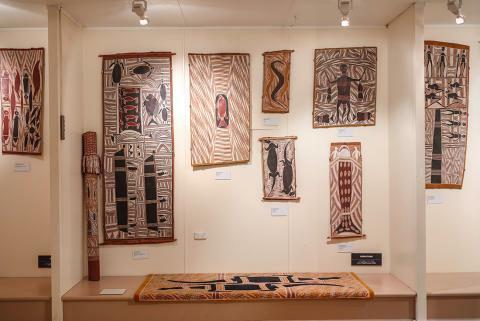 The Buku Art Centre presents art works created by men and women of the many Aboriginal clans in the area, with paintings, sculptures, wood crafts, and cross hatching techniques on display. There is also an opportunity to purchase unique artwork from the gallery and learn about how this establishment serves as a learning centre for the local children of the surrounding communities. Enjoy a final meal with your group at the Walkabout Hotel in Nhulunbuy and reflect on your experiences over the past few days. • Wake this morning and enjoy a final breakfast with your fellow travellers, before being dropped at the airport for your outbound flight. 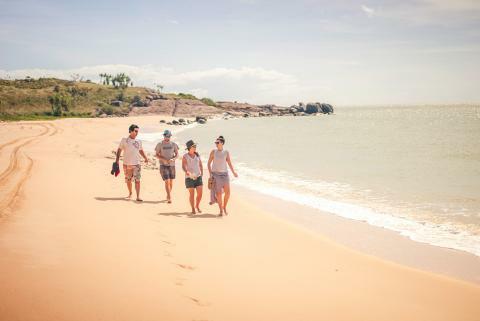 •Join us for privileged and exclusive access to East Arnhem Land. •Take part in traditional hunting, fishing, and gathering on country •Learn about gender roles and responsibilities, kinship and moiety, stories about the area and history of the region •Sit around the campfire with East Arnhem Land’s traditional owners and listen to the stories and songs of their people •Be welcomed by the Yolngu people and learn about their traditional methods of hunting and gathering, bark painting and basket weaving. 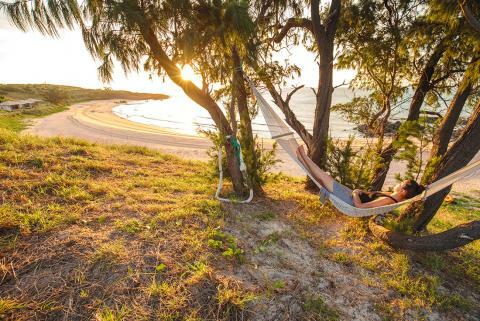 •Travel to remote Bremer Island and spend two days exploring this beautiful oasis. •Visit the Yirrkala community and its world famous art gallery featuring Aboriginal and Torres Strait Islander art work. 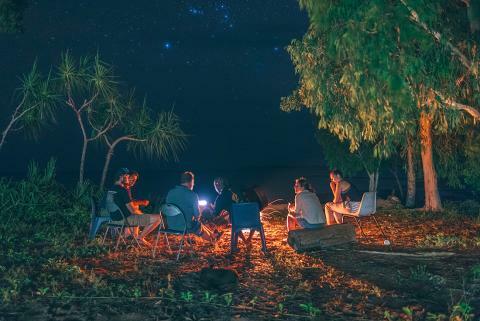 •East Arnhem Land remains the same rugged wilderness that the Yolngu people’s ancestors walked, so accommodation is camping with basic facilities, but in a unique environment, under incredibly clear, star-filled skies. •This is a truly remote region. There is no Wi-Fi and no phone coverage. This is an ultimate bush experience. 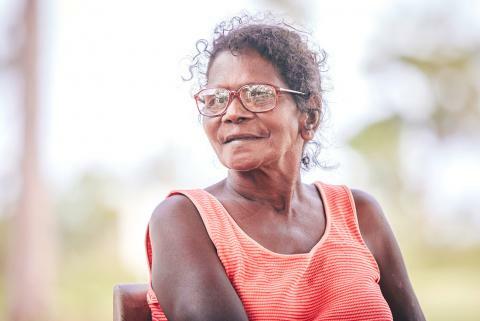 •The Yolngu people’s culture and history is incredibly important to them, and they want to share it with the outside world. To be part of this is a privilege and requires sensitivity and patience towards guides and staff. 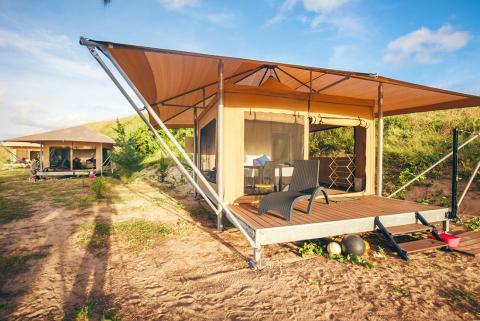 • Original-style camping is in shared permanent twin-share tents that feature cosy beds, wooden floors, full linen, lighting, power points, a bedside table and fans. Shared Bathroom facilities. Those travelling solo aren’t charged any extra if they’re happy to room-share with someone of the same gender. For those who’d prefer their own room. This trip is Basix level and consists of camping with basic facilities, wilderness lodge and motel accommodation. 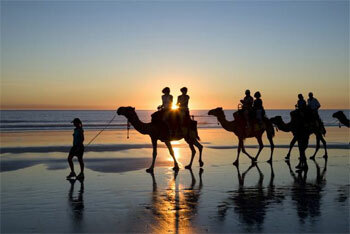 Accommodation is twin share and solo travellers will be paired with another person of the same gender. Due to the unique accommodation we use, single supplements are not available. All bedding is provided. Booked and paid E-Ticket, Sturdy walking shoes, hat and sunscreen, toiletries, warm clothing in winter, water bottle (1.5L), torch, insect repellent/net, camera and batteries or charge, Second pair of shoes that can get wet, extra towel for swimming, Power pack for charging without electricity. Due to the transport methods used on this trip of small charter plane and also boat, luggage limits are restricted to 10 kg per person in a soft bag. Bring a small daypack with you that can be kept on your person whilst your overnight bag is being transported or kept at your accommodation. Please bring suncream of minimum factor 30. The intensity of the sun in the north can be extreme, and the slight humidity can disguise the feeling of hot sun on your skin. Please also bring insect repellant for the evenings. Simple, light clothing is best. Long pants or shorts are ideal. Please also bring a warm jumper for around the campfire and the evenings. A light rain coat may also be useful if the region gets unseasonally early rainfall, also to provide protection if there is water splash whilst on the boat from Bremer Island back to the mainland. There will be an opportunity to swim, so please bring bathers and a towel. There is not a significant amount of difficult walking or hiking however please bring a sturdy pair of footwear and a pair of casual thongs/ sandals. Remember to bring a hat with good sun protection. 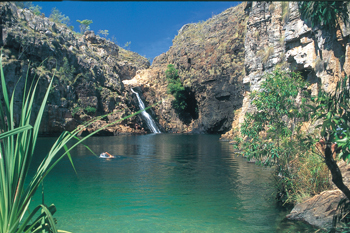 Much of East Arnhem Land is alcohol free. It is prohibited to take alcohol on tours. Alcohol can be consumed in Nhulunbuy at licensed premises however takeaway alcohol is not permitted. Smoking is permitted but please ensure you have a portable ash-tray to dispose of cigarette butts whilst on country. Due to the nature of this trip, there may be cultural sensitivities surrounding certain sites and topics. Whist we encourage you to be inquisitive, please be considerate when broaching potentially sensitive topics and respect the land and it's people. Please note that some of our planned activities are contingent on seasonal conditions. We will arrange alternative activities if this is the case. This is a flexible itinerary and may be altered to allow for better times to view certain inclusions depending on sunset/sunrise and weather conditions. During the peak of the tourist season May to September, you should generally expect clear blue skies day after day. Heavy rains can occur and may affect road access to more remote areas and this may cause closure of roads. Winter (June, July, August) night time temperatures can reach below zero. We reserves the right to cancel or postpone any tour due to unforeseen circumstances. Circumstances such as road conditions, flooding, mechanical defect, cultural considerations or other reason. 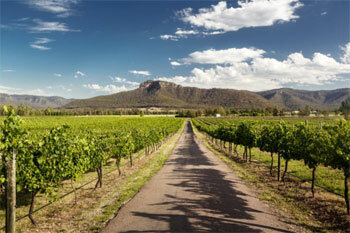 Maximum Walks: Two and three day trips that include easy walking. Hikes up to 6-8kms per day. A reasonable level of fitness is required as there will be some walking to view places of interest. 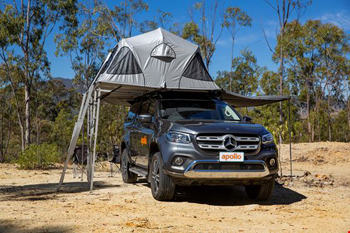 Suitable for soft adventures with a passion for bushwalking and exploring. Passengers must be fit and active. Air North flights to and from Gove are also available from Cairns, however the schedules differ. If you would like to book your INBOUND flight from Cairns please book this the day before the trip departs. 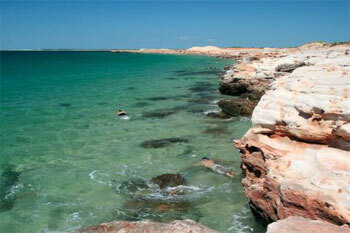 We recommend accommodation at the Walkabout Hotel in Nhulunbuy where we will meet you the following day.